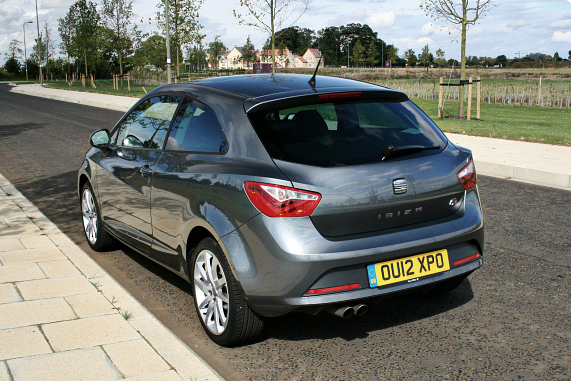 The Ibiza has for a long time been SEAT’s best selling model, few realise that its been about for nearly 30 years and is now in it’s fourth generation. Earlier this year the Polo-based hatch received a thorough reworking to keep it fresh in the face of increased opposition. The car you see here is fitted with the most potent petrol engine available in sporty FR trim. It certainly look the part and is far sportier than most of its rivals even in base trim which is clearly the influence of ex Lamborghini designer Luc Donckerwolke, who is responsible for its sharp looks. The SC (Sport Coupe) has a much lower roof line and smaller rear overhang that accentuates the shape further and looks particularly menacing in Monsoon Grey metallic. If you opt for an FR it gets wide 17″ alloy wheels and an aggressive front bumper and subtle rear diffuser with twin tailpipes. 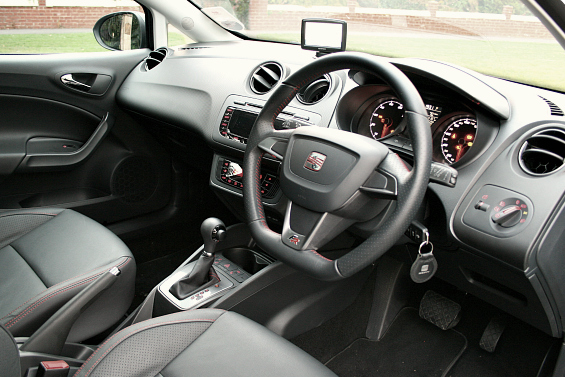 From the drivers seat it’s easy to tell that you are sat in something a little racier than normal thanks to the meaty-looking three-spoke, flat bottomed steering wheel with FR badging. The leather pews are also very comfortable and well contoured with red stitching which extends to the DSG gear shifter. The dials are racy-looking too. Cabin space is befitting of the Coupe name with a low roofline reducing the amount of space in the back for lankier passengers. Despite front seats that pivot and slide quite a bit forward once in the back legroom is severely restricted. Including a middle seatbelt is a tad on the optimistic side. 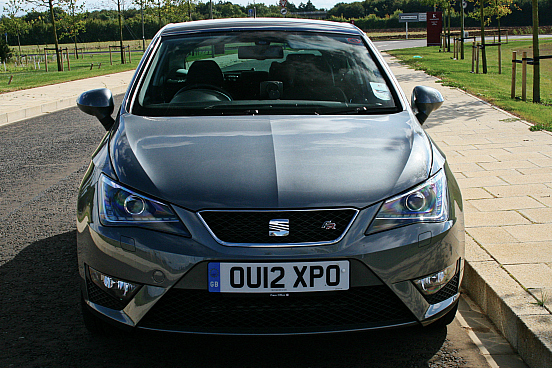 If you want a small hatch with all the toys then the Ibiza FR doesn’t disappoint. Cruise control, LED rear light clusters, sports suspension, ESP, 16” alloy wheels (optional 17” on the catr pictured), digital air conditioning, electric/heated/folding mirrors, portable TomTom sat nav and best of all an XDS electronic differential lock. Intended to be a milder hatch than to the 180 bhp Cupra you could be thinking the FR will fail to excite in the same way. I am pleased to inform you that you would be wrong. It’s actually powered by the same 1.4 litre TSi engine that is not only turbocharged but is also supercharged. Considering the FRs sports suspension it actually rides surprisingly well. Initial damping is excellent, dealing with undulations in the road with ease. Larger road imperfections highlight the cars stiffer spring rates, but it never loses composure, always feeling taught and controlled. As a result the Ibiza really handles with well contained body movements and a great feeling of fluidity through any series of corners. Turn-in is also crisp with steering that feels suitably meaty during cornering. Keen drivers will however find themselves wanting more from the steering it terms of feel, but it’s almost there. The XDS electronic differential lock that juggles power between the front wheels provides the driver with endless levels of grip. Only when pushed really hard do the limits of the chassis become obvious as the rear loses grip but everything is kept nicely in check by the standard fit stability program. With so much power on offer from what seems like a small 1390 cc engine most wouldn’t expect low running costs but the Ibiza delivers on that front also. Fuel economy is nothing short of outstanding at 47.9 mph combined, I managed a pretty decent 42mpg whilst with me. Emissions are also competitive at 139g/km which equates to £110 per year in road tax. In our eyes the FR is also well priced at £15,875 on the road considering the amount of standard equipment including the truly brilliant DSG Gearbox. 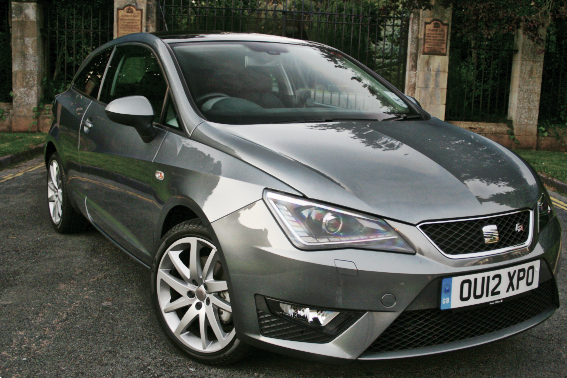 This entry was posted in Car Reviews, Cars, New Cars, News and Views, Performance Car, Popular Cars, Small Car and tagged alloy wheels, car leasing, DSG, FR, hot hatch, Ibiza, Ibiza SC, seat, TSI, UK by Rob McSorley. Bookmark the permalink.